At the beginning of the spring, I invested (it was only 4.99) in one of those bubble guns, where you put the little container of bubbles into the bottom and press the button and hundred of bubbles come out. I have never been able to blow bubbles at the rate that my kids would like to pop them, so this seemed like a very wise investment to me. After having the gun a few weeks, we of course ran out of bubbles and the small plastic container that holds the bubbles accidentally got thrown away. I bought a six pack of mini bubbles thinking they would fit the gun, but of course they didn't. So rather then let them go to waste, I thought we would use our 6 pack of bubbles for something fun, bubble painting. 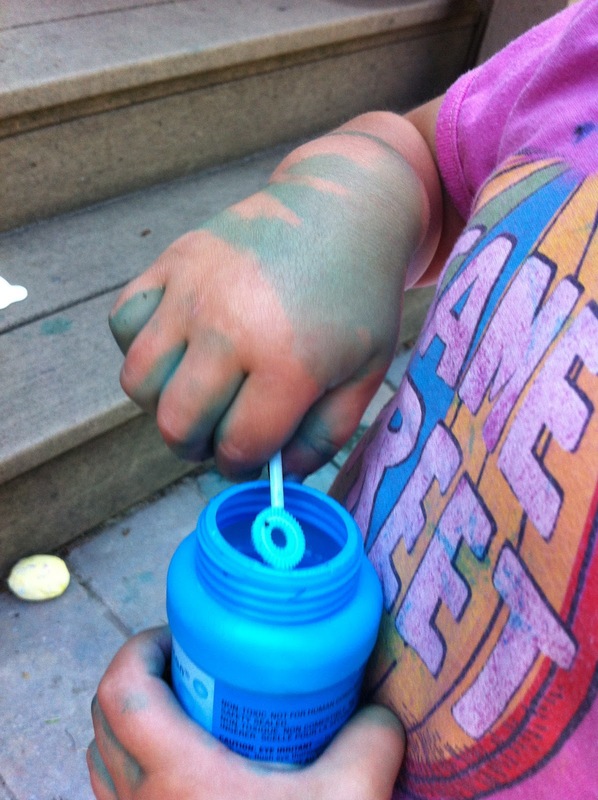 We started by coloring each container of bubbles with 10-20 drops of food coloring. 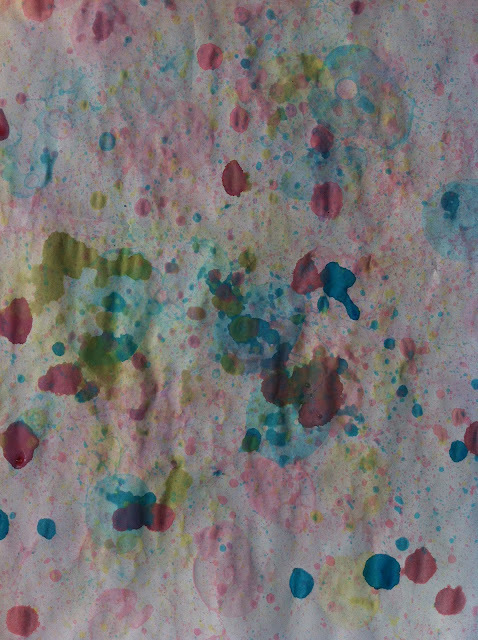 We used the food coloring for the painting pictured above but we also tried liquid watercolors, which worked well too. After mixing up a few different colors we went outside and laid two large papers on the ground. I then turned the bubbles over to the Bee and Bean who were amazed (as was I) at the marks left on the paper as the bubbles hit and popped. We used all the different colors and experimented with a few different poses to find the best way to get our bubbles to hit the paper. We found that standing right over, or even on the paper and blowing downwards seemed to work the best. The Bean loves bubble but doesn't always realize that liquid spills out when you bend over, so she was beautifully painted by the end as well. Fortunately it was just food coloring and washed out with a good scrub in the bath. Our finished paintings turned out beautifully the colors dry a little lighter so I might try adding more paint or food coloring next time. That looks like a fun summer activity. My daughters would have fun with that. I have collected empty bubble blower bottles for just this activity and now you have reminded me to do it - thank you. 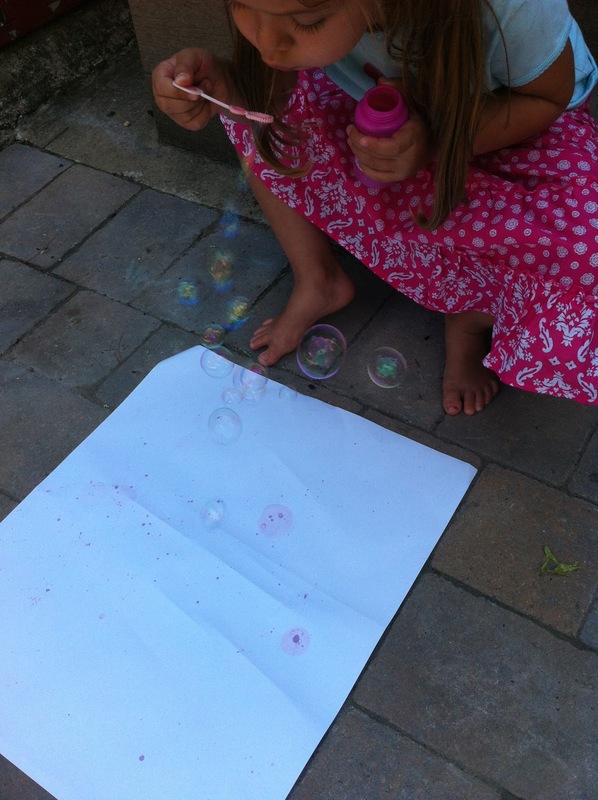 One of my daughters favorite activities is Bubble Painting! So much fun! Thanks so much for sharing your post with this week's Kids Co-Op linky!